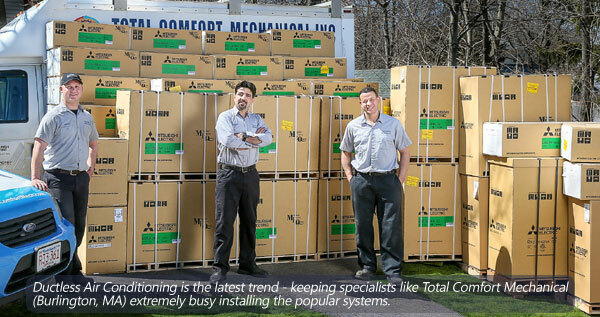 Previously Sold Out, Mitsubishi Ductless Air Conditioning Units Again Available in the U.S.
Burlington, MA – In recent weeks, heating and cooling customers in Massachusetts and throughout the country have anxiously awaited the availability of Mitsubishi heating and cooling products. Due to the explosive popularity of these high-efficiency air conditioning and heat pump systems, the manufactured inventory by Mitsubishi Electric sold out before the end of 2013, causing a limited availability of the popular ductless heating and cooling mini-split products in the United States. 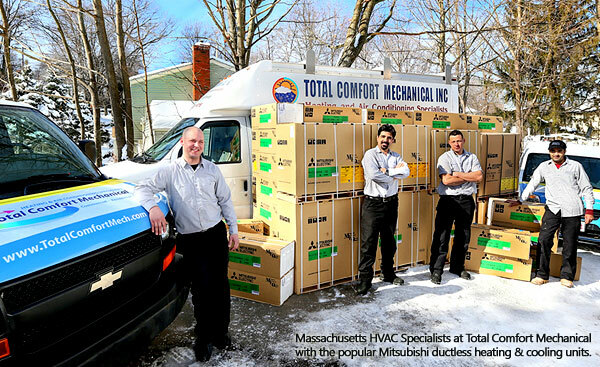 HVAC specialists and Mitsubishi Diamond Contractors like Total Comfort Mechanical, Inc. of Burlington unfortunately experienced back-orders of the product of up to six weeks. Total Comfort Mechanical is pleased to announce that the wait is over! 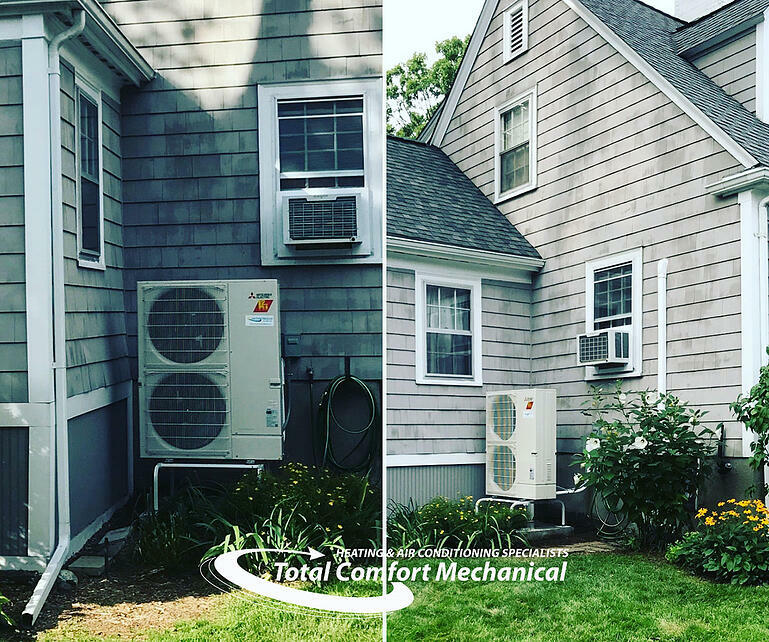 We are re-stocked and ready to provide customers throughout Middlesex County MA the latest, most energy-efficient ductless air conditioning systems available. There are plenty of reasons for the better-than-anticipated-growth of the Mr. 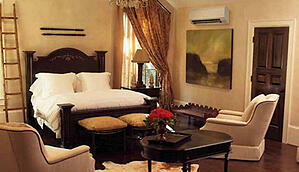 Slim ductless system and ductless mini-split heating and cooling systems in general. Happy customers from all over the world are raving about the product. When compared to window A/C units, duct extensions, baseboard heating and other alternatives to central heating & air – Ductless Systems beat them out when it comes to energy efficiency, noise level, comfort control, reliability, air filtration, and space-saving design. Installation is quick and easy – typically one day is all that is needed for installation of a ductless unit (one zone or Air Handling Unit ) by an experienced heating and cooling expert team – two days at most. In addition, there are generally no home modifications required to install a ductless mini split. Versatility – the units fit well into virtually any interior design plan. They can be mounted in a number of ways to complement your home or office décor, including high-wall mounting, floor mounting, ceiling mounting, or even recessed wall and ceiling mounts. Refined, SMART system controls and components such as floor-to-ceiling temperature sensors which save energy while providing supreme performance. Many rebates and incentives are available from local utility providers. Some offer incentives up to 30%. Ductless air conditioning systems consume less energy than traditional central air conditioning, and zoned systems provide control over individual room temperature. They are also an attractive option for any on-the-spot heating or cooling needs, including enclosed sun rooms, upstairs bedrooms, computer rooms, exercise rooms, classrooms, hospitals, nursing homes, restaurants, hotels and churches. 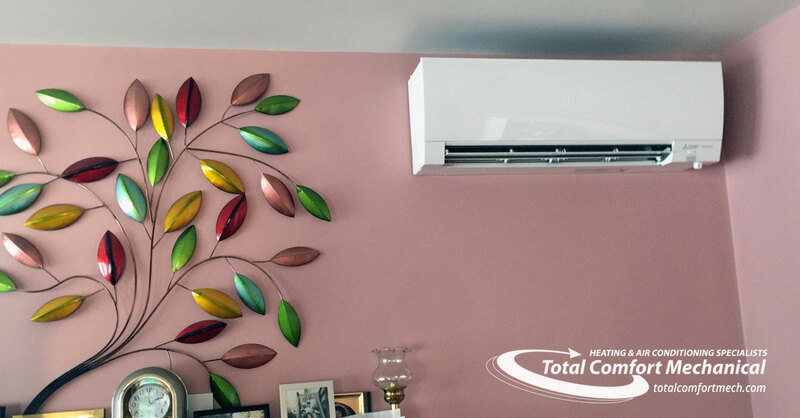 To learn more about the best Ductless Air Conditioning system options for your home or office, visit the heating and cooling specialists at Total Comfort Mechanical online or call (781) 697-9016.